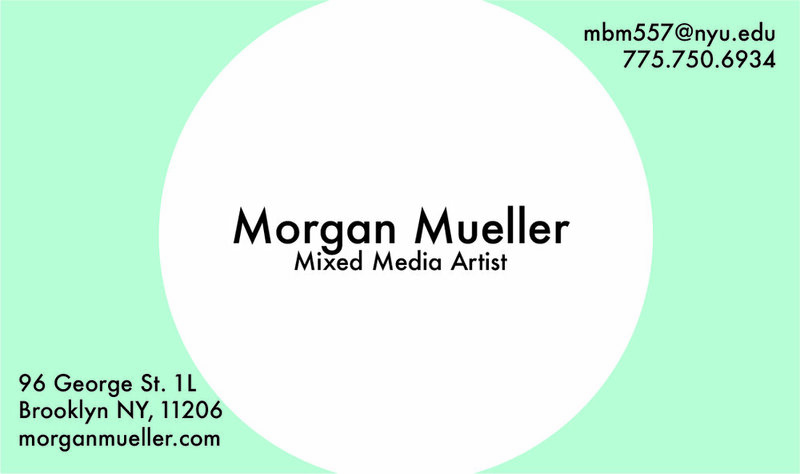 The final project for Visual Language was to design a personal business card. It was important to keep all of the design elements we learned over the semester in mind for the design. While we were going over the criteria for the assignment I knew that I wanted to keep the design simple and minimal. For me, this meant using only one main color and the logo I designed for my website last year. I wanted to incorporate a color from one of the color palettes that I created a few weeks ago and ended up on a paster blue/greenish color I saw all over Portugal. As far as the other design elements went, I got inspiration from a lot of different designs on pinterest and just searching the web. I chose Futura for the text and wanted to have both portions be offset to the corners. I initially wanted the design to just have a circle surrounding the logo and then nothing on the other side of the card besides the text but it felt wrong. Jenny Lin helped me to play with the circle and make the whole layout a bit more interesting and appealing to the eye. In all honesty I still want to work with the overall design. I think that this is more of a first iteration of the whole card that I will improve upon as my design skills increase. The first part of this week’s assignment was to create three different compositions with a given set of text and photos. Below are my three compositions. Each is focuses on different elements of the given information. I think that the first composition is my favorite, it is easiest for my eye to follow and feels less crowded than the other two. The last one is close but I think that the white title at the top of the photo throws me off a bit. For my Winter Show postcard design I wanted to try and focus on the human aspect of ITP. It is difficult to focus on that without acknowledging the technology portion as well. So I began thinking about how they interact and what elements I have seen, since being a student in the program, incorporate both. My first thought went to ITP student Sofia Luisa’s emoji mirror project seen here. When thinking about how to incorporate the idea of showing the people taking selfies with the mirror, Jenny Lin, recommended that I. do a top down view of the selfies in that I show the same photo zoomed in over the course of a few photos until it highlights that the photo was made of emojis. As for the rest of the postcard, I wanted it to be simple and unclustered. In all honesty I don’t think that the poster was actualized in a way I am happy with but I think that the concept is one that could be played with and improved upon. Part of my frustration with the postcard comes from the worry that the bleed from printers will make the small emoji symbols illegible and make the entire piece lose its overall context. This week’s Visual Language assignment required students to, first, choose a color palette that represents them and then use that color palette in six compositions. As I began brainstorming the project I knew that I wanted to use visual imagery to choose my color palette. I also decided that I wanted the palette to have a personal connection to me so I decided to choose from my photography portfolio. I decided to use a series of photos from my travels in Portugal and Southern Spain. The light tones and pastel colors are some of my favorite in Europe and bring back memories of my travels in that area. Below are a few photos that I added color palettes to. 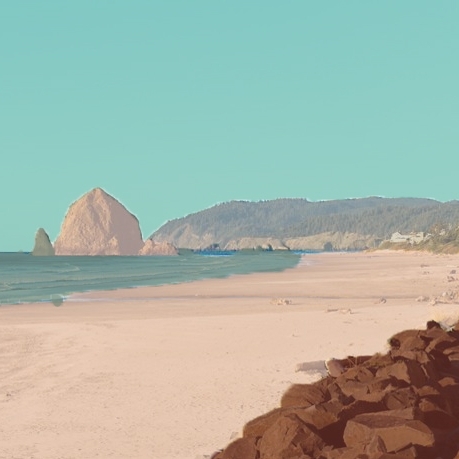 I decided to use the color palette from the fourth photo. the first few compositions I created came from the idea that this color palette is not common to see in large American cities or just in America in general. 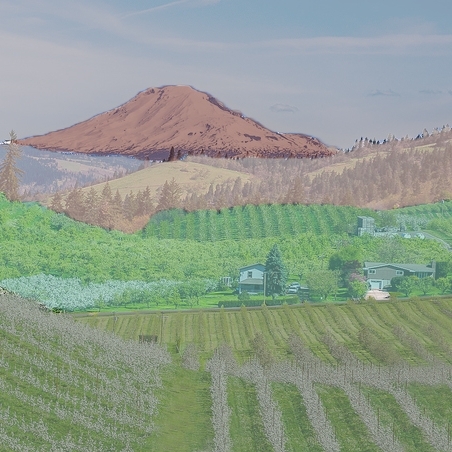 That being so, I decided to manipulate two photos from the Pacific Northwest and one photo of NYC to add this Southern Portuguese color scheme to. The next set of compositions I created were inspired by Spanish Artist Eusebio Sempere. I had discovered his work after visiting the Museo de Reina Sofia in Madrid earlier this year. My final composition is a modified piece I created for Computational Media. The piece itself is a parabolic graphic inspired by American Computer Graphics Artist John Whitney. I added my color palette to it and found it quite enjoyable to view. This assignment opened me up creatively to the use of color and how a certain palette can influence a piece of artwork. After a week spent going over typography and its wide range of purposes in design we were tasked with re-designing the boarding pass for Delta Airlines shown below. The original boarding pass is extremely cluttered and hard to navigate. My thought process in the new design was to prioritize information based on user perspective. The most important factors seemed to be the boarding time, gate number, and departure time for. If the person flying was to take a quick glance at the pass they should be able to see all the information they need in a few seconds. Other important factors to consider were for the person checking the pass. It needed to be clear that the information on that pass matched the flyer’s ID and be able to scan the pass with ease. Below is the design I came up with. In terms of typography i decided to use Din for all of the non graphical font as it had the best feel with the purpose of the ticket. I also decided to use different font sizes to highlight parts of the ticket that were more important. I also decided to lay the information out in columns to give the pass a more uniform feel. The next part of the homework was to create three different expressive word designs. My lack of illustrator skills caused me some setbacks with a few of the ideas I had in mind initially but each of the three designs I created expresses each of the words I chose. The first word I chose was signal. My thinking behind making the word wavy was that the word signal reminds me of sinusoidal signals. So as best I could I attempted to make a sinusoidalish shape with the word. The next word I chose was eye. After spending time playing around with words I drew a couple of dots in the word eye and and thought it was a bit comedic that the letter y looked like a nose in the middle and gave the word a sort of facial feature. The last word I chose was RIPPLE. I decided to have the word be mirrored and then have the mirror have a sort of ripple effect on it, kind of like it was looking at a reflection of itself in the water and a pebble was dropped into the water. This exercise highlighted my limited skill with photoshop and illustrator but it also had me thinking about words and how people think about words and symbols that represent them. New York is full of advertisements and signs for just about everything. This week’s Visual Language assignment required students to photograph two signs that they thought were designed well and two that were poorly designed, then choose one of the poorly designed signs and redesign to follow better design fundamentals. Beginning with signs that I think are designed well, whenever I walk around Greenwich Village these signs for the 25th Anniversary of the Village Alliance, hanging from light poles always catch my eye. The contrast of color and the simple design draw my eye initially to the large pink 25 in the middle of the sign and then to the text on the top and bottom of the number. I believe that the sign is a good design because of the simplicity in informing the reader of the purpose and the use of color and space. The other sign that I believe is designed well is actually an ad campaign for Lyft that I have been seeing on the L train all summer. The first thing I notice about these signs are bright colors and names of well known NYC places displayed in large block letters that are filled with cartoons depicting relevant scenes for the sign. After my eye moves from the main word or phrase I notice the minor text and graphics including the Lyft information. I think I enjoy each of these signs so much because they grab my attention for reasons other than them being ads. The graphics are pleasant to look at and if I didn’t know what the places were then I would be inclined to research them. I’ve lived in Bushwick for almost two years. 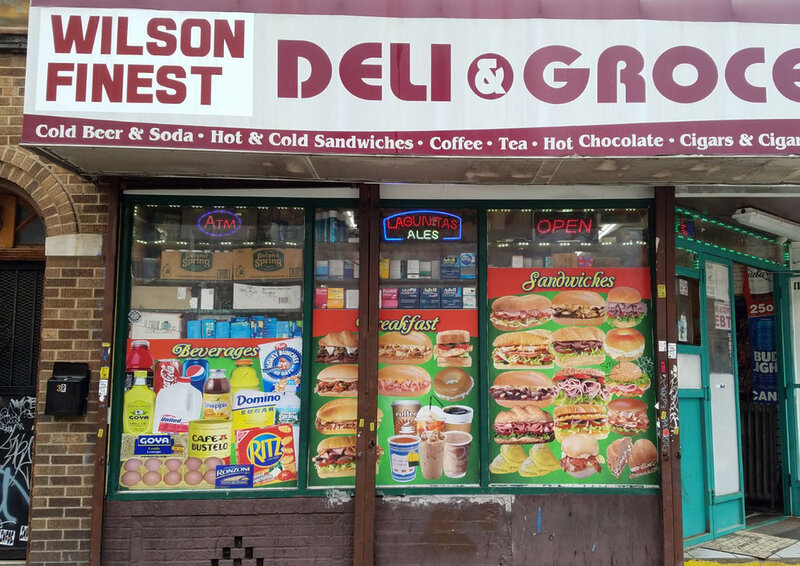 In that time I’ve walked by this deli numerous times and every time I see it I always chuckle at the layout of the prints on its’ windows, most of all the beverages portion. I actually love the ridiculous of this sign and similar signs on delis all over each borough but in terms of design the signs aren’t great. 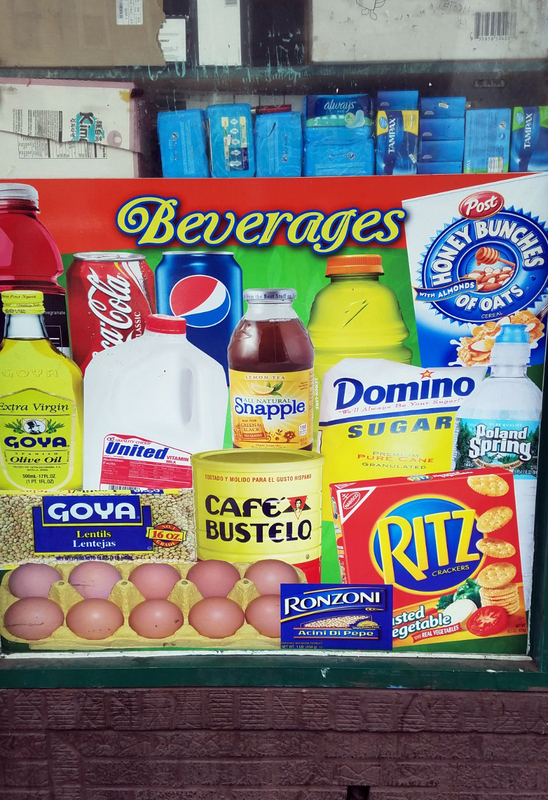 When first looking at the sign my eye is drawn to the word “Beverages.” Immediately after that my eyes wander around seeing all sorts of random food products, most of which not being drinks. This gives the sign a conflicting statement that could confuse the reader. There is also a lot going on in each of the signs which makes them feel cluttered and distracting. 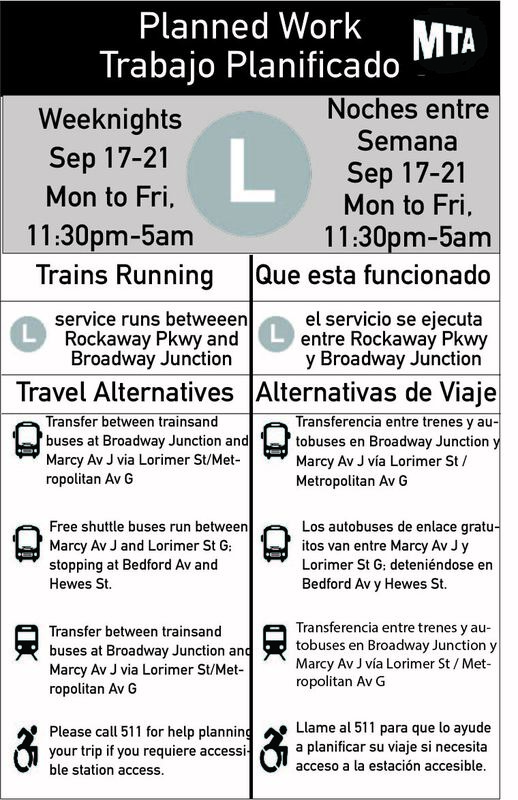 The second poorly designed sign, and the one I chose to redesign, was for an MTA service change on the L train. These signs are always around NYC and are difficult to read due to being densely worded and poor groupings of important text. This sign in particular has important text on the top that is too similar in size to the sub text. The sections for english and the spanish translation are grouped too close together so it can be difficult to distinguish parts of the poster. The alignment of the english and Spanish side is also off. Finally, the instructions for the service change are long winded and a pain to read through. Below you can see my redesign of the sign. I put most of the emphasis on the separation of english and Spanish, using clearer symbols for alternative modes of transportation, and writing clearer and less dense instructions. This redesign is in no way a final design but with the time constraint and my limited illustrator skills I believe that it represents my thought process. My experience with visual design has always been from the perspective of a user and consumer. That being said the first Visual Language assignment required students to analyze the design principles of a poster or similar form of graphic design. The exercise was great in helping me to take the basic design principles and techniques talked about in class and see how they can be applied to any graphic. 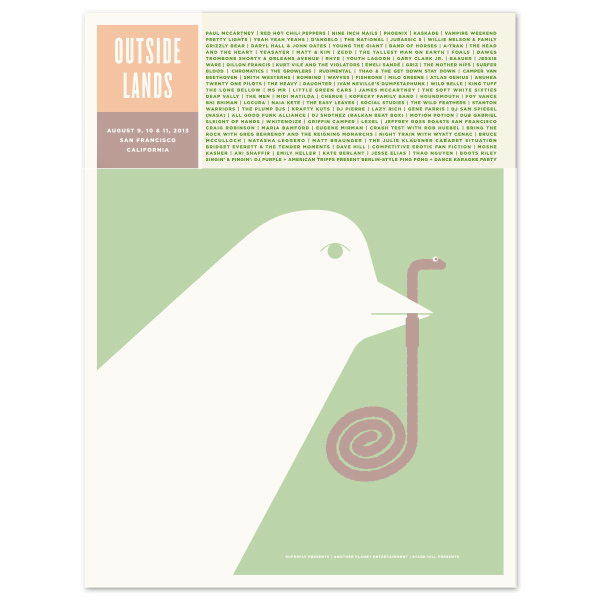 The design I chose to analyze was a poster for Outside Lands Music Festival, designed by Jason Munn. 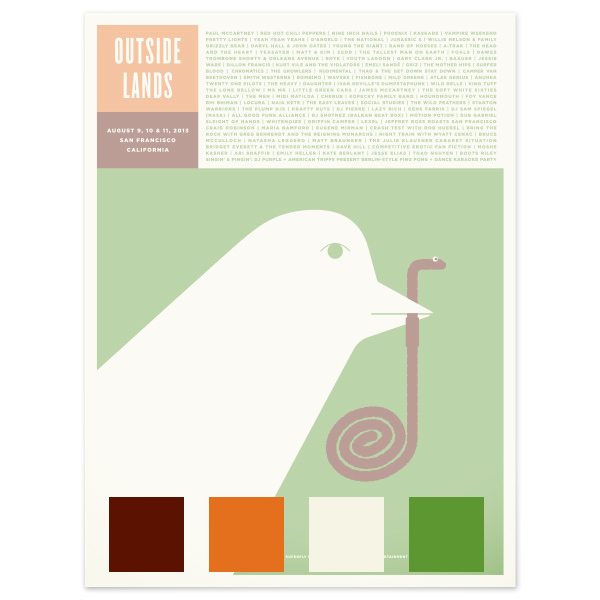 Outside Lands Music Festival Screen Print designed by Jason Munn. 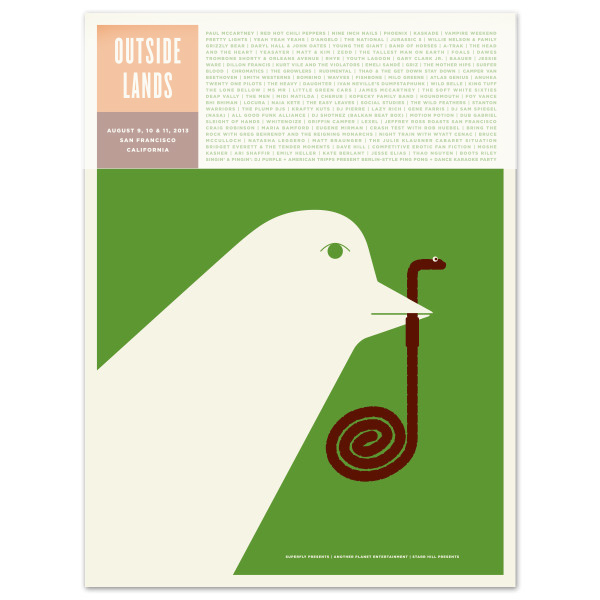 I chose this poster because I’m a fan of the simplicity of the design and the use of color and negative space. As I began to analyze the principles of design used in the graphic it was easy to see that it adheres to all three fundamental principles (clarity, consistency, simplicity). The block on the top left gives the name of the event and the dates it takes place. Block number two (top right) lists all of the artists performing at the festival. there is no formal border around this block but the words are aligned in such a way that it completes the rest of the outer border and forms its own block. The bottom, and largest block, is the focal point of the poster. In it there is an image of a bird holding a worm. The bird is interesting and simple because it is created out of the same color as the background, utilizing negative space. The overall drawing is very minimal as well which helps the eye flow through the entire poster with ease. From my observation, the grid structure was composed of four horizontal grids. The main grid point is between the top two blocks, which feel as if they flow into each other, and the bottom block. The bottom block feels as if it could act as its own scene. For the color palette the designer used earth tones that play well off of each other for this poster. The use of only four colors gives also adds to the feel of the poster. Using minimal earth tones complements the graphic on the bottom image and gives the overall poster a pleasing design. Topanga JNL Regular was the only font used in the poster. This gives the poster a minimalistic feel.